Another milestone, another time to reminisce about history. I just don’t know what to say about Alex Ovechkin anymore without saying he’s the best. We’re still in the middle of his age-31 season and as of minutes before tonight’s Capitals-Blackhawks game, the “Great 8” is sitting 29th all-time in goals scored at 546 and 84th all-time in points at 1,001. With goal-scoring coming at such a premium these days, some will find it quite difficult to measure how Ovechkin would really compare with the likes of Wayne Gretzky and Gordie Howe for the greatest of all-time. Thankfully, hockey-reference.com has tried its best. With adjusting every NHL game for every NHL season to six goals per game, it was determined that Ovechkin should really have 648 goals and 1,160 points. That is four away from being 10th all-time in adjusted goals. He only needs 189 adjusted goals from being SECOND ALL-TIME!!! That’s not inconceivable. Even if he stops passing the puck like he’s been doing since the days of Dale Hunter, Ovechkin only needs 237 adjusted points to finish in the top-2o all-time. In the upcoming All-Star game, the NHL is celebrating it’s 100th anniversary by announcing the list of 100 greatest players of all-time. I think Ovechkin should be on it and it shouldn’t be that loud of a debate. If for anything else, he is the reason why I blog about this sport called hockey. He made me appreciate the game for what it can be and he made me realize that hockey really can be unstructured, imaginative and fun in the face of too many people that want to do otherwise. If that doesn’t make him one of the greatest players of all-time, nothing will as far as I’m concerned. And now, on to the Nerdy 30. After an embarrassing firing of Gerard Gallant, it doesn’t seem like there’s much of a change in fortune to the Panthers since Tom Rowe took over as interim coach. The Panthers were 11-9-1 (89 point pace) under Gallant this season while Rowe has guided them to only an 8-7-7 record (85 point pace) since. That being said, Florida has gone 4-2-0 in their last six games. Could that be the sign of things to come? Probably not. During those six games, the Panthers have actually scored the same amount of goals as their opposition, 11-11. That 11 goal output is tiny, which is great defensively, but terrible if you are looking for signs of positive offense. This is a continued trend for Florida as there doesn’t seem to be a single player on the roster that is capable of hitting 60 points this season. Vincent Trochek, Aleksander Barkov and Jonathan Marchessault are solid pieces upfront, but none of them command a presence that should make Florida potent on offense alone. If one were to look at Florida’s shot chart from Micah Blake McCurdy, you can tell that, despite averaging a 13th best unadjusted rate of 55.5 shot attempts per hour at even strength, the net front presence has been lacking in their game this season. 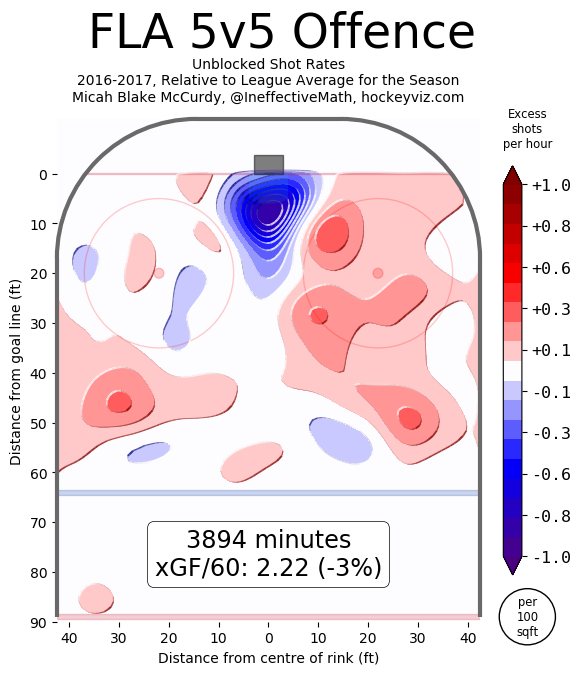 The evidence is even more clear at corsica.hockey where they’re calculated to have only generated a fourth worst rate of 7.22 scoring chances per 60 minutes. Put that all together and you have Florida only averaging 2.20 goals per 60 minutes in all situations. 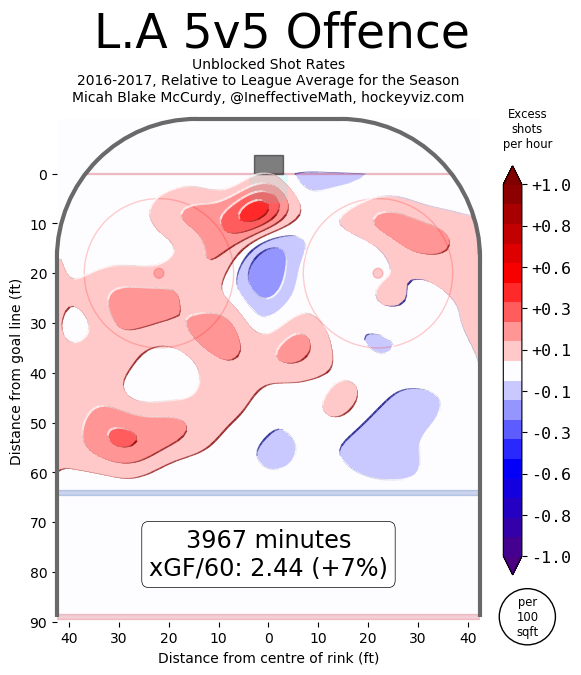 Now that expected goal rate rises to 2.56 per hour because of the higher ranked shot volume, but clearly, selection has to improve for the Panthers to ever get their offense going. All eyes should point to Nick Bjugstad to see if he can ever recover to the player he once was. This season, the big centerman only has four points in 21 games playing third line duty but he started the year on injured reserve due to a broken hand. 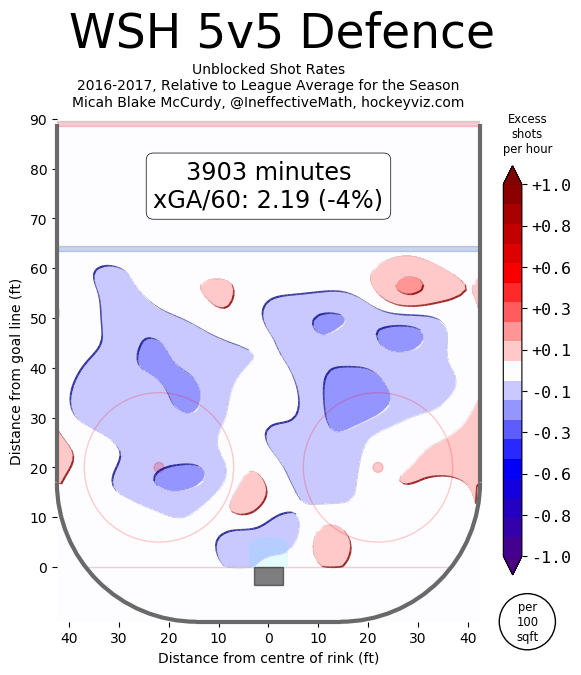 It was just three years ago that Bjugstad was another symbol of Florida’s bright future when he put up 2.01 points per 60 minutes at even strength as a 21-year old rookie. Surely, his on-ice shooting percentage of 0.82% (!!!!!!) at even strength won’t last after three straight years of having that mark between 7.46% to 8.04%. Still, he’s the key to Florida’s hopes as they are still in the thick of the playoff race and it will be another month until Jonathan Huberdeau returns from his own lengthy injury spell. When I last checked on the Predators, they seemed to get off to a rocky start that was hampered by their sub-optimal penalty kill and fourth line options. While their efficiency in short handed situations has improved to above league, their shot suppression in those situations is still only 22nd best in the NHL at 100.4 shot attempts per hour. That is a massive downgrade to the third best unit that they had last year when they only gave up 87.5 shot attempts per hour. Gone are the likes of Paul Gaustad and Eric Nystrom and Miika Salomaki has been out with a lower body injury since October 16th. Bluntly, the 23-year old Fin’s injury has put a real damper on Nashville’s two biggest weaknesses. It has forced head coach Peter Laviolette to play not just Filip Forsberg, but also Ryan Johansen and Viktor Arvidsson more ice time while shorthanded as well as the aging Mike Fisher and the always terrible Austin Watson. That resulted in general manager David Poile to make a few acquisitions in the last week to solve this issue. First, he claimed Derek Grant off of waivers from Buffalo. Then, he traded for Cody McLeod from Colorado in exchange for no-name prospect Felix Girard. With having Colorado retain 40% of McLeod’s $1.3 million salary, it will be quite difficult to find any stranger trades in recent NHL history. Still, both Grant and McLeod will not do enough to solve Nashville’s nightmares on the penalty kill. McLeod hasn’t played a single second in those situations with the Avalanche this year, while Grant only has 76 career games under his belt and has been on the ice for well over 110 shot attempts per hour. Add the fact that these two are very poor possession players at even strength and it makes you wonder if Poile was just too desperate to fix a need that isn’t that strong. If anything, adding two more problems to the equation might exacerbate the need even further. In the meantime, Nashville desperately needs James Neal back and completely healthy. Otherwise, there will be more situations where Watson will be given second line forward assignments and that screams disaster. If anything, I don’t understand why Calle Jarnkrok is stuck on the fourth line after having such good chemistry with Neal, Johansen and Forsberg last year. These lines needed to be sorted out by Laviolette really quickly, otherwise, Nashville might unnecessarily miss the playoffs after being such a good team last year. Basically, the Los Angeles Kings have become team Jeff Carter…and then everybody else. The 32-year old is still going strong to the tune of 22 goals and 39 points this season while the next closest point-getter happens to be Alec Martinez at 24 points. With an on-ice even strength shooting percentage being the highest it has ever been since 2010-11 (9.71%) and the highest individual point percentage he has had since stats.hockeyanalysis.com has been on the internet (85.2%), you have to wonder if Carter will start to regress to the mean in the worst time possible. That is because his production is still not good enough to guarantee the Kings a playoff position this season. Even though the Kings are among the better teams at even strength shot generation, they have gone from being the best in the league at 62.2 attempts per 60 minutes, to a fifth best rate of 58.2 per hour. While that may not sound like much of a downgrade, it always needs to be taken into account that Los Angeles always shoots at a below average conversion rate while under Daryl Sutter. Along with that, their shot locations continue to see them not be a strong team when it comes to attacking the front of the net this season. Losing Tyler Toffoli to a lower body injury since December 22nd really does not help matters along with the fact that Anze Kopitar, Marian Gaborik and Dustin Brown are predictably shells of their former selves. Almost every one of Sutter’s skaters have performed well in puck possession and Peter Budaj has held his own in the absence of Jonathan Quick, but their definitely needs to be an upgrade somewhere to get the offense going again. Could getting any of the scraps from Colorado be the best solution? Who says no in a Jarome Iginla for Gaborik and a first round pick trade? or how about Brown and a first for Matt Duchene? Either way, somebody else other than three forwards has to score for the Kings on a regular basis and it just seems like a broken record that assets have to be given up in order to make it happen. To be honest, it was getting quite miserable rooting for the Capitals this year. Despite them playing at a 100 point standings points pace or better for basically the entirety of the year, Pittsburgh, Columbus and the New York Rangers have refused to go away when it comes to being the best teams in the NHL.Was this really going to be another year where because of the NHL’s flawed thought process playoff system that we were going to get knocked out early for no reason again?!?! Along with that, Washington’s expected goal totals were showing how poor the Capitals really should be if it wasn’t for Braden Holtby. Thank goodness for that, because it was not even funny how bad it was to see the same defense corps that was so much better last year give up so many shots from in close this year. Games like the ones at Toronto and the last two defeats to the New York Islanders were really putting any hope of them winning a Stanley Cup into all-time lows since Barry Trotz took over as head coach. Then, the new year came around. Since that change in the calendar, Washington pulled off their four best wins in their current seven game unbeaten run. They include the come-from-behind 6-5 win over Toronto, their 5-0 destruction on Columbus’ 17-game winning streak, their 4-1 shellacking on puck possession wizards Montreal and their 5-2 win over rivals Pittsburgh. That’s four wins over four of the eight best teams in the NHL and not a single one of them were from us banking on trillions of lucky charms to get it done. In fact, since we kissed 2016 goodbye, Washington has been the number one event, score and venue-adjucted puck possession team in the entire NHL. Along with that, only Florida has done a better job at limiting shot attempts while shorthanded than the Capitals’ 83.5 attempts per hour rate. Now this team isn’t perfect. Karl Alzner is a shell of his former self and I still stand by the fact that Andre Burakovsky has to become a 50-point player for this team to guarantee a Cup Finals run. However, things in Chinatown have been much rosier than it was two months ago. Consider that the first three games I have been to (opening night against the Islanders, election night against San Jose and November 23rd against St. Louis), the notion of the games being “sold out” were complete and utter lies. If anything, the long security lines, bad metro train rides and the eternal tightness of every fans’ shoulders from holding their guards up from another disappointment were keeping the atmosphere from being as joyful as it was from regular seasons past. Then, my Dad and I went to January 3rd’s game against the Maple Leafs: crazy 6-5 slugfest in what felt like the present versus the future. Auston Matthews and Mitch Marner eternally ran rings all night and looked like they would blow out the hosts out of their own building. Then, after the Capitals scored to make it 4-3 to start the third period, an unrehearsed chant of “Let’s Go Caps” reverberated throughout the whole arena: like it was the good old days of 2008-2010 all over again. Only the players can truly know if that was why they came back and won, but I’d like to think that that chant alone kicked started their dominance and the team hasn’t been looking back. At the very least, you could tell in their last two home games since that night, the crowds have sounded louder and more supportive on television. Like all seasons, I won’t know if the Capitals will win the Cup or if they’ll do anything right this trade deadline to make them better. What I do know if the positive enthusiasm is back all around and may it continue into June.